A man in Florida was cited by state wildlife officers for killing an alligator without a permit after an inspection revealed gator body parts in his pickup truck, and the poor dead critter's foot sticking out of the dashboard. Officers had stopped his truck in Corbett Wildlife Management Area, a swamp region northwest of West Palm Beach, to check the driver's day pass. 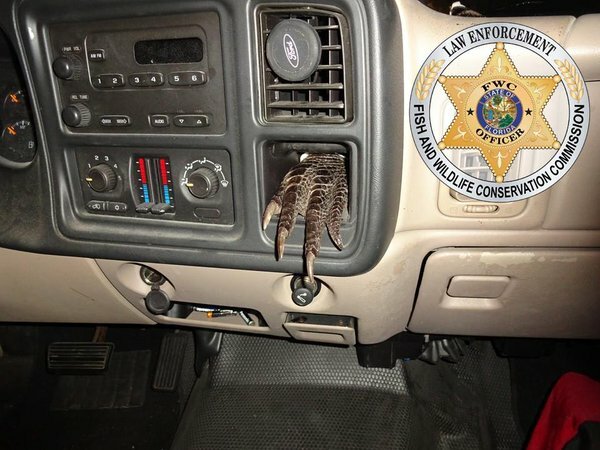 Officers said they noticed an alligator foot hanging out of an opening on the dashboard and several alligator parts in the ashtray. They said another alligator foot was in the bed of the truck. After reading him his rights, the man confessed to killing the alligator a few days prior without a permit, officers said.